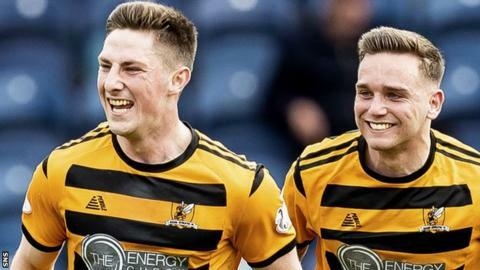 Jordan Kirkpatrick's injury-time winner allowed Alloa Athletic to climb out of the Scottish Championship relegation zone by beating Queen of the South. The substitute's header, three minutes into time added on, came against the run of play with the hosts pressing desperately at the other end. Jim Goodwin's men, who now sit eighth, opened through Andy Graham but Kyle Jacobs levelled for dominant Queens. Alloa's first Dumfries win for 16 years ends a run of four league defeats. While Gary Naysmith's men fall behind Dunfermline Athletic into fifth place. Queen of the South goalkeeper Alan Martin produced a fabulous stop to deny Dario Zanatta but was powerless to prevent Graham converting Ian Flanagan's corner minutes later. The home side's superior possession paid off early in the second half when Jacobs pounced after Neil Parry had saved Callum Fordyce's effort. After equalising, the Palmerston Park outfit threw everything at Alloa. Top scorer Stephen Dobbie surged forward at every opportunity but could not add to his astonishing haul of 38 goals in 34 games. The veteran striker did have the ball in the net at one point but the offside flag was raised. Lyndon Dykes and Nicky Low also came close before Kirkpatrick delivered the sucker-punch, nodding home a lovely ball from Zanatta. Alloa Athletic manager Jim Goodwin: "We're delighted with the result. With five minutes to go, I'd have been delighted with a point, we were hanging on. "Queens were the better team by a country mile but we've played a lot better than we did today and lost so you've got to take it when you can get it." Queen of the South manager Gary Naismith: "I'm a bit shell-shocked to be honest. Until their goal in the 93rd minute, I actually don't know if Alloa got into our half. But for us to lose the game in that manner it's disappointing. "We needed a result today and I would have been disappointed getting one point with our performance. To get zero is really disappointing." Match ends, Queen of the South 1, Alloa Athletic 2. Second Half ends, Queen of the South 1, Alloa Athletic 2. Lyndon Dykes (Queen of the South) wins a free kick in the defensive half. Foul by Jack Hamilton (Alloa Athletic). Goal! Queen of the South 1, Alloa Athletic 2. Jordan Kirkpatrick (Alloa Athletic) header from the right side of the six yard box to the high centre of the goal. Foul by Fraser Aird (Queen of the South). (Alloa Athletic) wins a free kick in the attacking half. Attempt missed. Stephen Dobbie (Queen of the South) left footed shot from outside the box is high and wide to the left. Attempt missed. Stephen Dobbie (Queen of the South) right footed shot from outside the box misses to the left. Attempt saved. Stephen Dobbie (Queen of the South) header from the centre of the box is saved in the centre of the goal. Substitution, Alloa Athletic. Jon Robertson replaces Iain Flannigan. Steven Hetherington (Alloa Athletic) is shown the yellow card for a bad foul. Andy Stirling (Queen of the South) wins a free kick in the defensive half. Foul by Steven Hetherington (Alloa Athletic). Substitution, Queen of the South. Ian McGrath replaces Nicky Low. Attempt missed. Fraser Aird (Queen of the South) right footed shot from outside the box misses to the right. Attempt missed. Stephen Dobbie (Queen of the South) right footed shot from the centre of the box is close, but misses to the right. Andy Stirling (Queen of the South) wins a free kick on the left wing. Attempt saved. Dario Zanatta (Alloa Athletic) right footed shot from the centre of the box is saved in the centre of the goal. Scott Mercer (Queen of the South) is shown the yellow card for a bad foul. Steven Hetherington (Alloa Athletic) wins a free kick in the attacking half. Andy Graham (Alloa Athletic) wins a free kick in the attacking half. Corner, Alloa Athletic. Conceded by Jordan Marshall. Steven Hetherington (Alloa Athletic) wins a free kick in the defensive half. Scott Taggart (Alloa Athletic) wins a free kick in the attacking half. Substitution, Alloa Athletic. Jordan Kirkpatrick replaces Alan Trouten. Foul by Alan Trouten (Alloa Athletic). Corner, Queen of the South. Conceded by Scott Taggart. Attempt saved. Iain Wilson (Queen of the South) right footed shot from outside the box is saved in the bottom left corner. Corner, Queen of the South. Conceded by Kevin Cawley. Foul by Iain Flannigan (Alloa Athletic).